On Saturday November 19th, the LICF family will join together with the Transgender Community to say NO to violence, bigotry and hate. 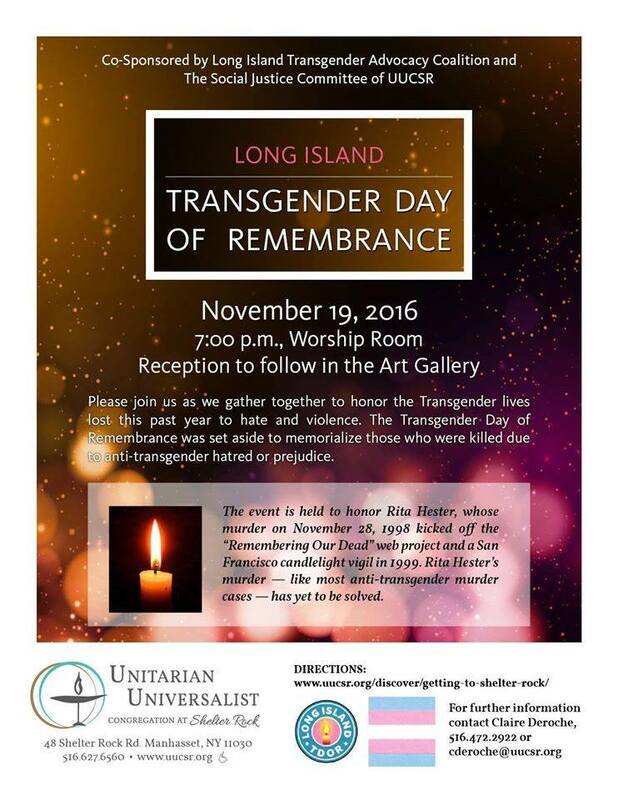 We unite to remember those who were lost to hate crimes in this past year by attending the Long Island Transgender Day of Remembrance (TDOR). TDOR serves to raise public awareness of hate crimes against transgendered people and to publicly mourn and honor the lives of victims of anti-transgender violence. The service consists of speakers, musicians, trans voices in which local transgender people speak of their life journeys in dealing with their gender identity and the very emotional reading of the names of those lost during a candlelight vigil. The LICF Gospel Choir will be performing at the event.